The annual drive urging nurses and other healthcare staff to have their free flu vaccination is underway, following a fall in numbers last year. As the vaccination is not compulsory, it is up to campaigns and employers to convince staff of its benefits, and many NHS organisations are encouraging immunisation to protect vulnerable patients. Some employers are trying to inject a bit of humour into campaigns. The NHS in Merseyside has posters saying ‘Get your flu jab (because we’re sick of producing these posters every year)’, and staff in Hartlepool have recorded a song, ‘5,000 jabs’ to represent their 5,000 employees. 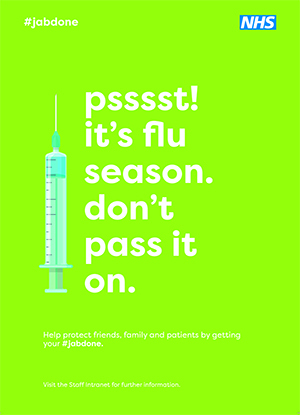 NHS Employers (NHSE) works with Public Health England, supported by the Department of Health, to run the annual flu campaign. In 2010-11, the year before flu fighter was launched, staff vaccination rates in England were at 34.7%. This rose to a high of 54.9% in 2014-15, but dropped to 50.8% last year, and further efforts are needed to convince some nurses to receive the vaccine. Last year, the lowest uptake among staff groups was 44.9% for qualified nurses (not including GP practice nurses), while the highest uptake came from GP practice nurses at 65.2%. This means highlighting the fact that there is only a one in a million chance of an adverse reaction to a virus, according to the Medicines and Healthcare products Regulatory Agency. RCN professional lead for public health nursing Helen Donovan says: ‘This is not about making nurses feel guilty but pointing out that it is the responsibility of all front-line healthcare staff to get the flu vaccine. The highest uptake of flu vaccinations came from GP practice nurses. Trusts in Northern Ireland are trying new initiatives this year to meet their overall uptake target of 40%. Last year, a total of 24.6% health workers were immunised, a 2% rise on the previous year. Initiatives include Belfast Health and Social Care Trust partnering with the NHS flu fighter campaign and using peer vaccinators for the first time. The proportion of registered nurses in England were immunised, the lowest uptake among staff groups. This figure rose to 65.2% for GP practice nurses. Last year, Wales came the closest it ever has towards reaching its target of 50% when 47.3% of frontline NHS staff were vaccinated. Nursing and midwifery staff were also slightly above the target at 50.1%, equating to 12,655 immunised out of an eligible 25,249. .
A third of health and social care staff in Scotland received vaccinations last year – 17% below the target. The figure for the previous year was 36.3%. Scotland’s chief medical officer Catherine Calderwood urged staff to get vaccinated for personal and professional reasons. She says: ‘Staff are a significant cause of transmission of the virus to patients and colleagues, and vaccination will also protect their own health’. Flu vaccination programmes run until 31 March. A hard-hitting campaign has led to more than four in ten nurses already receiving their flu vaccine at South Tees Hospitals NHS Foundation Trust. The trust’s poster and social media campaign features photographs of real-life patients, including a woman wearing wearing an oxygen mask, with the slogan ‘I already have one fight on my hands. I’m relying on YOU to fight the flu’. Another, featuring neonate baby Jude, reads ‘I am fighting to get well. Please don’t make me fight the flu too’. 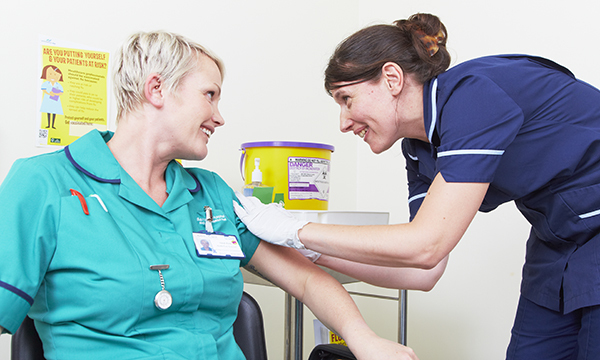 A total of 1,305 nurses, midwives and health visitors at the trust (44.1%) have received the flu vaccine. Compulsory flu jab for NHS staff – moral duty, or morale wrecker?